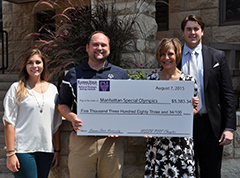 The Kansas State University National Strategic Selling Institute, along with the local chapter of national sales and marketing business fraternity Pi Sigma Epsilon, recently teamed up to donate more than $5,000 to the Manhattan Special Olympics. The funds were raised through last semester’s National Strategic Selling Institute, NSSI, auction, an annual event that is organized by students in the institute’s advanced sales class, in conjunction with Pi Sigma Epsilon. The students work together to find items for the auction and sell the tickets to the event. Half of the net proceeds from the auction were donated to Manhattan Special Olympics, with the other half going toward the institute’s Sales Cup Merit Awards, which go to students who have earned performance points through their classes and participation in sales competitions, networking events, workshops and other institute events.